In the world of technology we like to focus on the super expensive devices, the ones that push the envelope in every direction. People love to “ooh” and “ahh” over every new feature, quirk or change that it brings to the table. In doing so, sometimes we can overlook the simpler things, the less expensive gadgets that a recent college graduate(me) can afford. I’m a sucker for finding affordable technology. I built my computer using parts from one if not two generations behind the latest iterations, and my current phone is the modest if unassuming iPhone SE. My wife was in the market for a new iPad for her work, and wanted an all-in-one solution to replace her aging laptop(with Windows Vista, ugh I’m dying). She takes notes, sends emails and records videos as a stage manager for multiple community theatre projects. So having something more portable than a laptop, with the ability to do more than her iPhone 6, all in a single device was the goal. The new iPad fills that role perfectly. With iOS 10’s multi-tasking features enabled only on newer devices, we examined the iPad lineup for 2017, and we settled on the iPad 9.7 which starts at $329. What does that price get you? 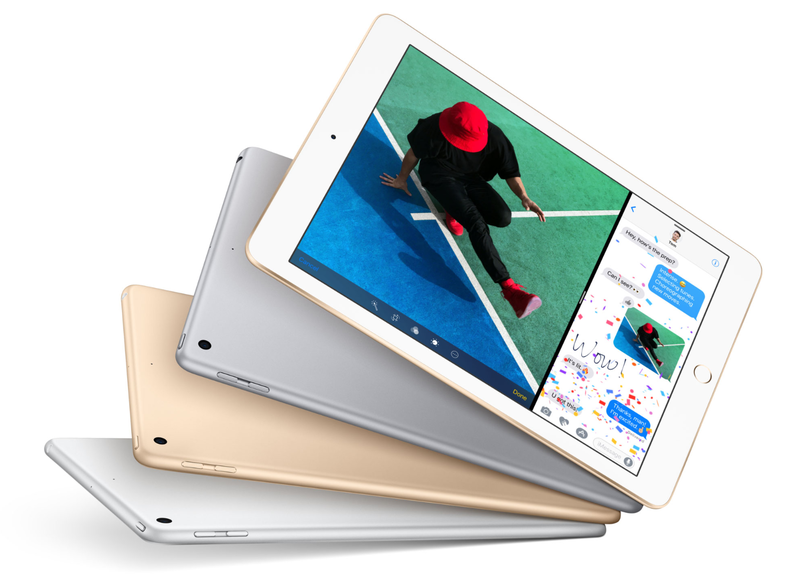 An iPad with a 9.7 Retina Display that is brighter than the Air 2 it replaces, the newer Apple A9 processor, 2 GB of RAM for better multitasking, 32 GB of storage, and a battery that is 15% larger than the iPad Air 2, or Pro 9.7. We paid an extra $100 for the increased storage option at 128 GB, but you may not find it necessary. Essentially this is a combination of the iPad Air 1 in overall design, iPad Air 2 with the camera, Touch ID, and no toggle switch, and iPhone SE with matte bezels and a lower starting price. It’s the bargain hunters dream when it comes to finding a new iPad with more screen real estate than an iPad Mini. Paired with a bluetooth keyboard, the iPad 9.7 is a great tablet for light email productivity, browsing the web and of course for binge watching Netflix. All is not sunshine and roses though. The display is not fused to the glass like on iPad Air 2, meaning that glare is more of an issue than before(though this does make screen repairs less expensive). The true-tone display on iPad Pro doesn’t make the jump to this iPad either. What’s more is that the 4 speaker system and Apple Pencil support on the Pro stays with the Pro. If you want a more detailed comparison between this iPad, and the other 9.7 inch iPads(Air 2 and Pro 9.7), I would suggest watching Detroitborg’s iPad 2017 video on Youtube. Now before you get too disappointed, remember that an iPad Pro 9.7 at a matching storage configuration costs $599 for 32 GB or $699 for 128 GB. That is $270 more for an incremental upgrade in display quality, Apple Pencil support and maybe a 15% increase in speed in a device that is nearly a year old. We found that it wasn’t worth the extra cost for us, and I’d suggest waiting if you are looking at getting an iPad Pro as newer models are expected this fall(if nothing else, you will be able to find great deals on the current model of iPad Pro after the next iPad Pro is announced). This iPad is not meant for the power user. It’s meant for the every day person like my wife and I who want to enjoy our content on a larger screen, with a fast and up to date software experience without the pro level price. If you’re in the market for upgrading from an older iPad, or if you are going to give the Apple ecosystem a try, the new iPad is a great tablet at an affordable price.